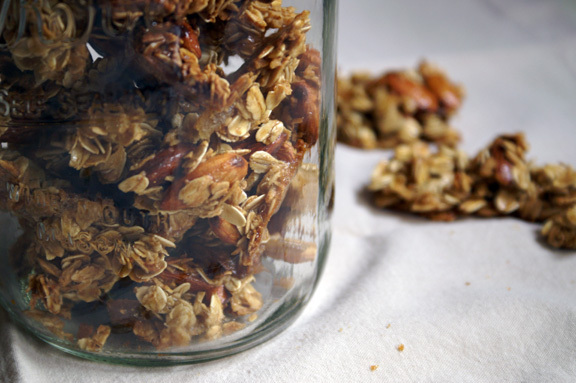 I’ve been secretly making this granola for far too long not to tell you about it. It started a few months ago, when Faygie at Life Tastes Good posted it. I love her anyway, but I was hooked instantly: a plain vanilla granola? From someone who I know loves vanilla and treats it like a flavor and not just an ingredient? Yes, please. Growing up, vanilla ice cream is all I would eat. Seems weird now, considering I’d try almost any flavor you’d put in front of me, but I just didn’t see any need to venture out when vanilla ice cream was my jam. I didn’t like to muddy the waters. I wasn’t the kid who wanted chocolate chips, marshmallows, or chunks of bubble gum in it (gross; do they even still make that? ); just hand over the plain vanilla and I was (and still am) happy. As adventurous as I am with food, I’m aware of my roots, and I have a loving appreciation for the oft-ignored vanilla. There’s a reason vanilla is so common, people; it’s sorta perfect. It plays well with pretty much everything. And there’s so many nuances to it, depending on where your vanilla is from: Tahitian is very floral and fruity, Mexican has some wood and spice kick to it, Bourbon Madagascar is creamy and strong. It’s very much like coffee in the way that vanilla is always vanilla, but you can detect subtle differences if you pay attention. To me, that’s interesting. I’ve talked about how much I love granola before: I’ve given it as gifts, party favors, and passed along recipes to friends. Jennie at The Messy Baker makes two of my favorites (maple nut and pumpkin + apple butter), and she excels at making granola bursting with massive flavor. Her granola, very much like Jennie herself, I imagine, is the life of the party. It wants to kick it with you. Faygie’s granola is the granola that wants to kick back with you. It wants to come over, hug, and have a cup of tea while you discuss current events, the music you’re into right now, and the intricate details and Maggie Smith one-liners contained in Downton Abbey. It’s subtle, but full of flavor. It’s simple and clean – where Jennie’s granola reminds me of the excitement of the holidays, Faygie’s reminds me of the calm, blissfully sparse feeling January brings with it. So it’s perfect for right now, while we’re all scaling back on the partying a bit. 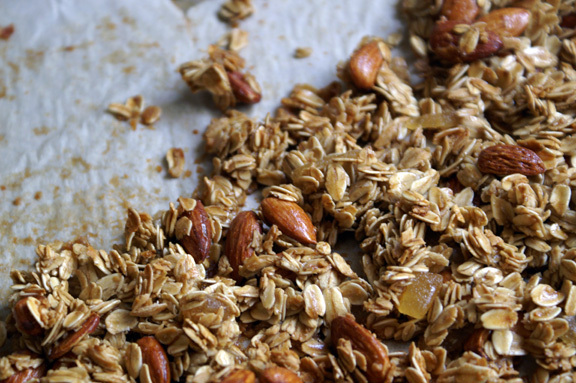 This granola is like the white bark on a birch tree; it doesn’t get more lovely than this. I’ve altered it enough to feel comfortable doing a version of it on my own blog. It needed no alteration, so what you see here is just what it’s morphed into for me, and not an attempt to improve things; it was, and is, perfect as it stands on her blog. Over time, I’ve switched up some of the measurements, added a generous handful of whole almonds, and given it a little unexpected zip with some crystallized ginger, which is optional, but gives it a twist while letting the vanilla shine through. You tailor it to how much you crave ginger (or not). I do crave it; that there have been several recent posts featuring ginger is no accident. I snack on this granola plain, a cluster at a time. I throw it into my greek yogurt, sometimes with fruit, sometimes without. I have it with coffee. I have been known to snake a piece out of the jar when I’m walking out the door to the gym. It’s my everything snack; if you try it, it might become yours also. 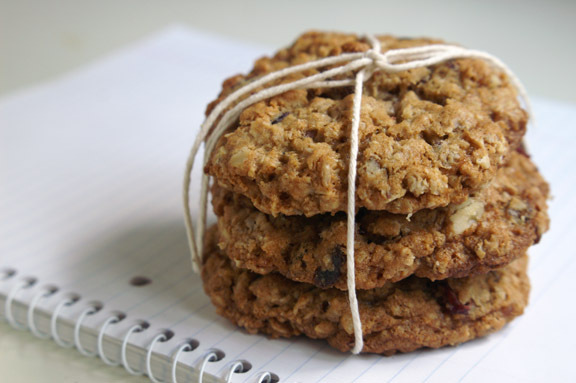 Adapted from Faygie’s honey vanilla granola on her lovely blog, Life Tastes Good. Note: It’s worth mentioning that you really should be using the best ingredients here. Recipes with few ingredients beg for you not to skimp out on them, because you can’t cover things up as easily as you can with other, more involved recipes. So in turn, I implore you: use the good stuff. I don’t mean expensive, just of a quality you know to be good. 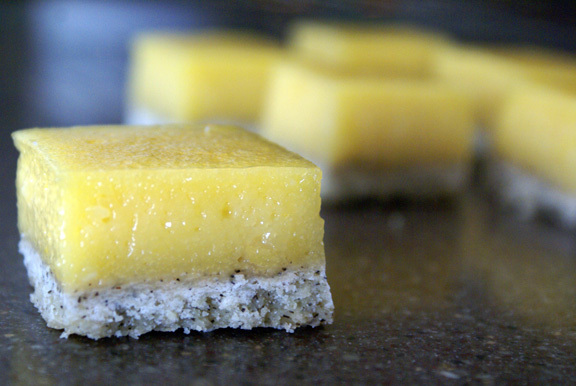 Preheat your oven to 325˚F and line a lipped half sheet pan with parchment paper. It is essential here versus bare pan or aluminum foil; the parchment keeps the underside from darkening too much. 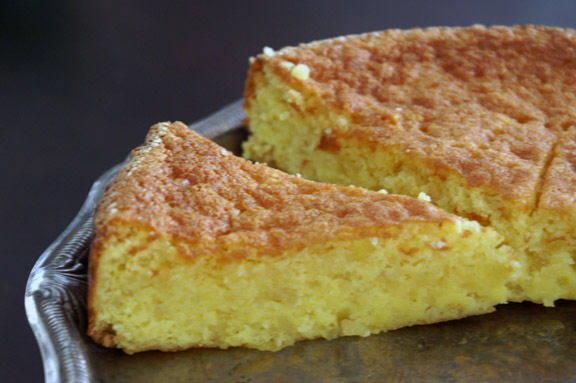 In a small bowl, combine the egg whites, oil, brown sugar, honey, and vanilla and whisk to combine – you want to make sure that everything is incorporated, and the oil can be resistant. In a large bowl, combine the oats, almonds, salt, and chopped ginger and toss with your hands to evenly distribute. Pay special attention to your ginger here; depending on how sticky yours is, it may try to clump together, but you’ll feel that with your fingers. Press any clumps out and the oats will do the rest of the work to un-stick things. Once you’re sure everything is evenly tossed together, pour in your liquid and use either a wooden spoon or rubber spatula to combine. Don’t punk out here; keep lifting and stirring until you know it’s entirely coated with your liquids, or you will be grumbly later on when you have dry, sad patches. Pour into the center of your prepared sheet pan, using your spoon/spatula to spread it out all the way to the edge of the parchment. While you’re doing this, take the top of your utensil of choice and poke the granola clumps away from each other; basically, you’re forming little spaces between clusters, which allows for even cooking and ready-made clusters with no wet spaces towards the middle. Bake for 20-24 minutes until you see the edges just starting to get golden and darker; don’t let it go much further than that. You may feel the urge to stir; resist this urge. Stirring could cause you granola to break up into smaller pieces. Remove it and let it cool completely on the pan. Break into clusters when cool and store in an airtight container. This granola sounds yummy! Vanilla is the best. I could totally see myself kickin’ it with this granola while watching a movie. I love that you love my granola. I have a new recipe in the works; it’s a chocolate lover’s dream come true. it is SO good! I can actually see you kicking it with this one too. Of course i love your granola; what’s not to love! We made the pumpkin spice one all christmas/new year’s when my mom and sister were here (although my mom can’t get enough of the maple nut one – like she talked about it the WHOLE TIME.) A chocolate one, you say? I wish i could “pre-bookmark”…because i would. yum! I still need to try the banana one you did. 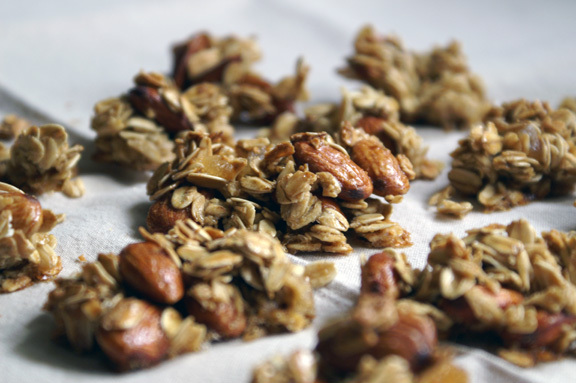 I’m a big fan of keeping granola around the house for quick snacks and light breakfasts, and this one definitely sounds like it would be a great addition to my usual repertoire… love the idea of adding little bits of crystallized ginger for zip! Granola is such a great go-to snack when you just need to grab something that isn’t a cupcake, right? It keeps me away from the other not-so-good for you things in my pantry most days. I hope you try it! Especially if you’re a ginger fan…it’s mostly vanilla in flavor, but the ginger is a nice little surprise every so often. Thank you, tina! I love this for breakfast, for sure! So, I made homemade vanilla and I’m like…totally looking for an excuse to use it. Because it’s like gold to me. Iiiiiii’m thinkin’ this is a good place to start. i was JUST reading about homemade vanilla in the Dahlia bakery cookbook last night as i was forcing myself to meander through them! Why have i never made this? WHY HAVE WE NEVER MADE THIS! I feel at this point you are contractually obligated to make this granola due to what you just said. And our contract. (scribblescribblecrumple) here’s the contract. After a few months of oatmeal for breakfast, Kevin practically begged me to start making granola again. So I will. There’s so many different combinations to try! strawberry is one of my other faves, and it’s very childhoodish! you can’t do much better than a fresh strawberry ice cream with big old chunks of berries in it, i think. i’ve never been a huge fan of the French vanilla sort; it really IS a strange color!! i was always a vanilla bean type of girl. twins alert: a few years back, mr. table fell in love with a haagen dazs vanilla frozen yogurt with honey and granola in it; and it was GOOOOOD. alas, they’re the kings of limited edition flavors, so it hasn’t been around forever, but he still talks about it. i was thinking of using this granola as a jumpoff for that, because it’s so very vanilla and tastes a lot like what that ice cream tasted like that. granola-making is addictive, right? I’ve been making it repeatedly since i guess this summer, because i love the way it makes my house smell, it’s so incredibly easy to make, and what a great snack to have around the house. I get sad when people don’t respect the vanilla; i get it, because it’s in everything so it’s incredibly common. I’m sure i’ve been guilty of it myself at times, too, but i have a deep respect for it now, for sure. Done. Experimental controls are critical for success! oh no, just what i need … MORE GRANOLA!!! it’s really a curse that it’s so easy to make…. I just made a batch of this tonight. OMG, YUM!! I can’t stop eating it! I love the bit of heat from the ginger. oh yay i’m so happy you liked my version! the ginger is pretty fun, right? I now keep a little bag of crystallized ginger on hand for granola at all times. Love it with the vanilla! I LOVE homemade granola. So much better than the rock-hard, chunky stuff at the grocery store. Plus, during the winter one needs hibernation food – this will fit the bill. Also, vanilla ice cream is basically the only kind I eat. It drives my family nuts. I just don’t understand store-bought granola anymore now that i know how to make my own. it’s like biscotti; once you know that it’s a million times better to make it at home, you wonder how you ever ate pre-packaged. This is certainly winter hibernation food. Vanilla goes with everything. it’s like a black dress. or a white tee shirt. it just IS perfection. done. Agree.